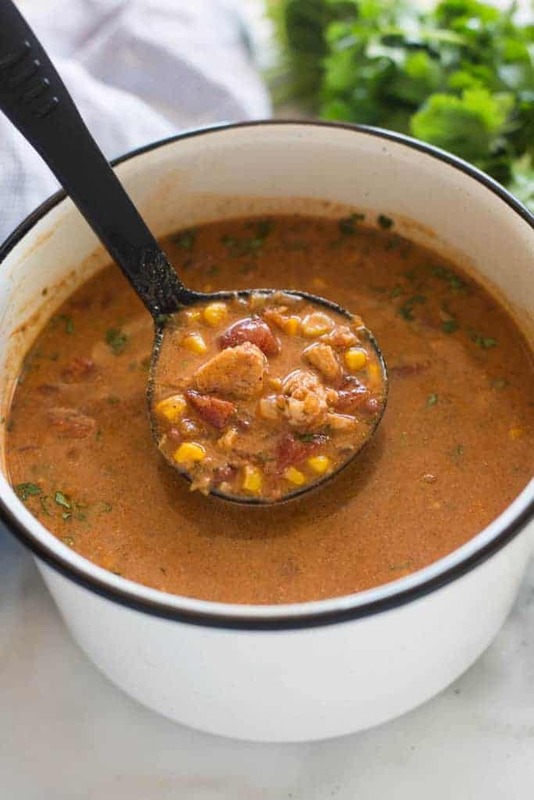 This tex-mex inspired Spicy Chicken Soup is bursting with rich, deep flavor. It’s hearty, and deliciously comforting. A family favorite. My first experience with this soup was when a friend of mine made it at a girls night we had. I instantly fell in love! She gave me this recipe, which I’ve adapted and I’ve made many, many times since. It is now one of my favorite soups, ever! That may be because I’m obsessed with all Mexican flavored dishes, and this has a lot of Mexican inspired ingredients in it. I tried and tried to think of a better name than “Spicy Chicken Soup”, because this soup isn’t overly “spicy” in the heat-your-mouth-up, tobasco or hot sauce, kind of way. It just has a lot of spices in it. The spice level also really depends on what type of salsa you add to it (mild, medium, or hot) to determine how spicy it is. The recipe starts by cooking the chicken in a pot of seasoned water. I love this method because the chicken is flavorful and juicy and shreds easily. The shredded chicken is added to the soup, along with the leftover seasoned water it was cooked in, which adds tons of amazing flavor you just wouldn’t get by adding a few cups of plain water. A can of chili beans and some condensed tomato soup add an added richness and bold flavor. 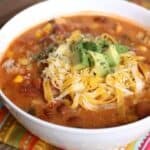 I love this soup topped with a sprinkle of cheese and some fresh avocado slices, to help balance out the flavors and texture. You could also serve it with crushed tortilla chips. 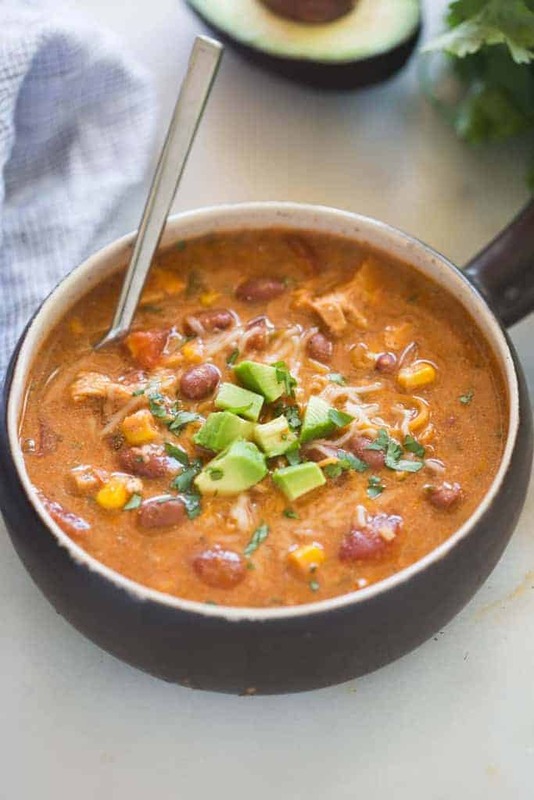 This tex-mex inspired Spicy Chicken Soup is bursting with rich, deep flavor. It's hearty, and deliciously comforting. A family favorite. In a large pot over medium heat, combine water, chicken, salt, pepper, garlic powder, parsley, onion powder and bouillon cubes. Bring to a boil, then reduce heat and simmer for 20-30 minutes or until chicken is cooked through. Remove chicken, but reserve broth. Shred chicken. In a large pot over medium heat, cook onion and garlic in olive oil until slightly browned. Stir in salsa, diced tomatoes, tomato sauce, sugar, chili powder, cumin, corn, chili beans, shredded chicken, and 3 1/2 cups of the reserved water. Simmer 30 minutes. Stir in sour cream. Taste and add extra salt, or additional seasonings, if needed. Garnish with cilantro, cheese, avocado, crushed tortilla chips, or whatever you like! I have to say, the pictures really sucked me in here. Looks delicious, and I will try it soon, thanks! I’m a bit confused by the “4 cups of chicken broth or 2 cubes of bouillon”. Is the broth to be added to the reserved broth after the chicken cooks? Is the soup supposed to have the 4 cups of water and the 4 cups of broth or is optional? Hi Pam, I’m sorry, that was confusing. I’ve updated the recipe so it should be clearer now. Just use the water that you boil the chicken in at the beginning, and then add 2 or 3 chicken bullion cubes towards the end, as instructed, for flavor. Thanks! Hope you love it! Looks delicious, and I will try it soon, thanks! Is “chili beans” referring to a can of either pinto or kidney beans? Or do you mean a can of chili with beans? Is there anything I can use instead of the chili beans? Hard to come by here in Azerbaijan! :) By the way, I am so glad I came across this blog. Have made the lasagna and it was delicious! Making the Gyros today. Hello all the way in Azerbaijan! I’m so happy you liked the lasagna! You could substitute pinto beans for the chili beans and add a little extra seasonings. Hope you enjoy it, and hope you liked the gyros, too! DELICIOUS! This is a go-to recipe for sure! Very easy recipe and very good tasting also.